Established since 1935, T. G. Kiat & Co (Pte) Ltd have been manufacturing Rose Brand Syrup for the community. With our Traditional Recipe and Quality Ingredient, many have enjoyed and found Rose Brand Syrup a superior drink. The first & original Rose Syrup originated from Singapore. Our Rose Syrup is made from our Traditional Recipe to become one of the best tasting Rose Syrup over the world. A Superior drink made from our Traditional Recipe. 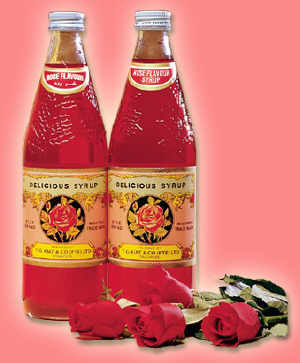 Our Rose Syrup is well accepted by all levels of the society in different countries. Rose Brand Rose Syrup (also known as "Kiat" Brand Rose Syrup) was first introduced into the Middle East by a Royal Prince. Even today, it is also consumed by the Royal Families in the Middle East as well as in Brunei. In these countries, we have become a household name. We have been exporting to many countries like UK, USA, Hongkong, Australia, France, Brunei, Bahrain, Kuwait, Dubai and many others. We are currently still looking for Importers, Wholesalers, Commissioned Agents and Distributors in different countries to introduce Rose Brand Rose Syrup to many different countries in the world. For more than 60 years and over 3 generations, we have served and benefited so many people in the community with our Premium Product - Rose Brand Syrup; and we hope to be able to serve more people with our delicious drink which is suitable for all occasions. INSIST on Rose Brand Syrup only [ by T. G. Kiat & Co (Pte) Ltd ] for tradition and quality. One of the best manufactured Rose Syrup made entirely from our original recipe and premium ingredients. A Premium Quality Rose Syrup worthwhile drinking.